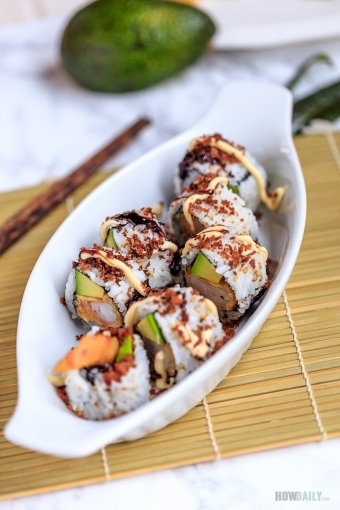 The most popular types of all sushi is the maki or maki roll. 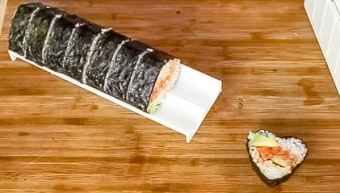 This is a type of sushi where nori is wrap around sushi rice and fillings ingredients into a cylindrical roll. 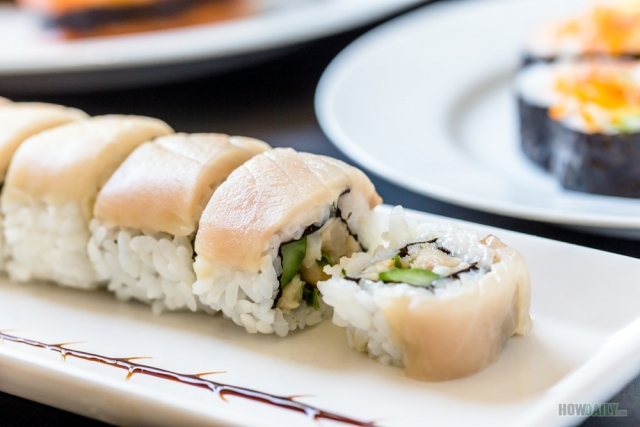 For more details on maki sushi, read this different types of sushi. 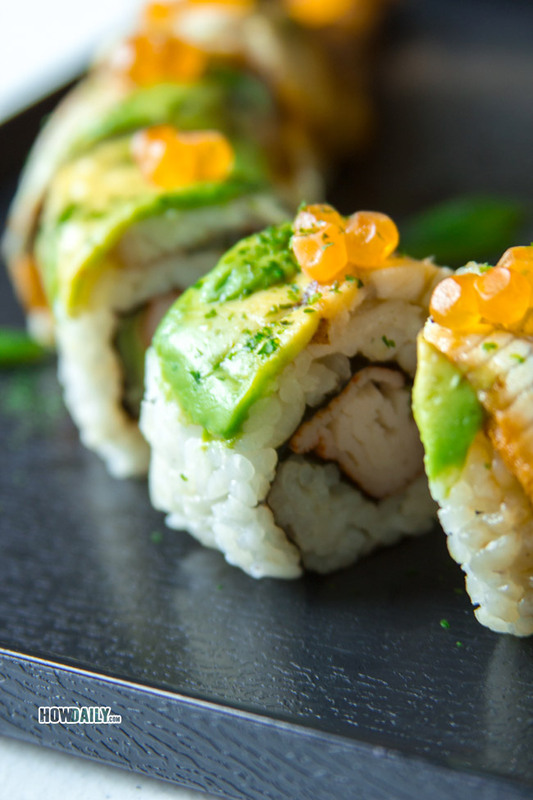 As you might know, maki is divided into several types of roll, mostly based on their sizes, from the smallest (thin hosomaki) to medium chumaki or the thickest futomaki. Then there’s the hand roll (temaki), but that’s another story. 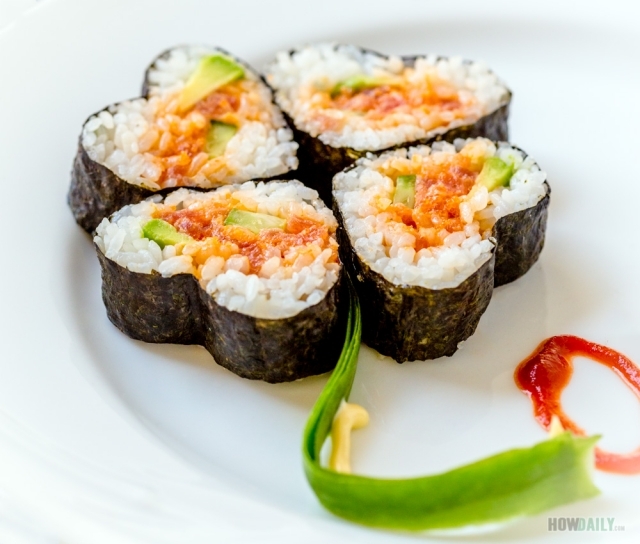 Anyhow, this article aims at getting you to make your own maki sushi roll at home, using the tools you might already have… or not. 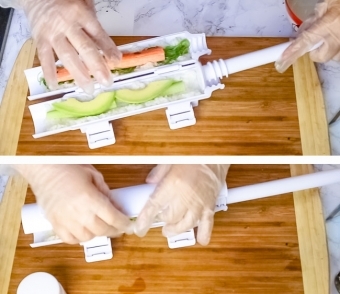 If you have steady hands and uses to doing detail works, then you can make beautiful professional looking sushi roll with just a bamboo mat, or simply shaping with a kitchen towel. 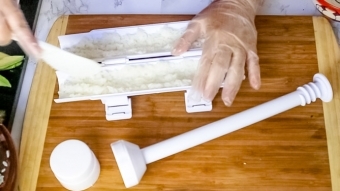 On the other side, if you are kind of aukward with those small jobs, you could get by with one of the many best sushi making kits to help rolling maki sushi. 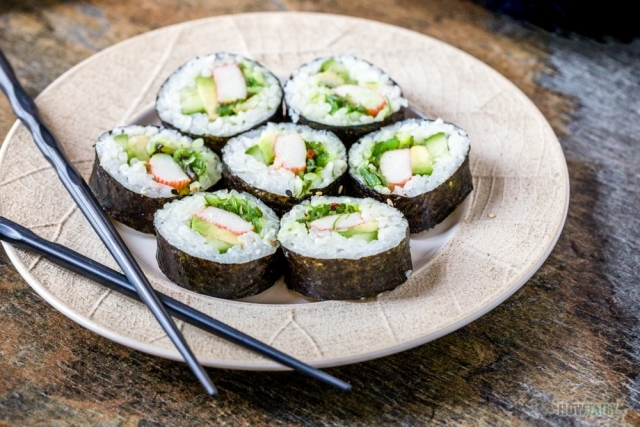 Alright, let’s gather your nori, some basic filling like cucumber, avocado, imitation crab, and sushi rice. Practice does make perfect, so just be patient and keep trying ok. You’re surely to find one of the methods below that will fit you best. 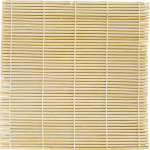 Wrap the bamboo mat with plastic wrap – this will the prevent the mat from getting soiled and flavor fused, in case where you’re rolling with many different fillings. 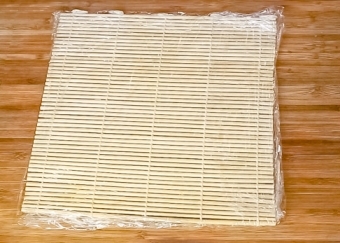 Place a sheet of nori with the texture side upward onto the bamboo mat. 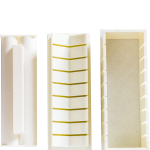 Use half sheet for thin (hosomaki) roll, ¾ for medium(chumaki) roll or full sheet for thick (futomaki) roll. 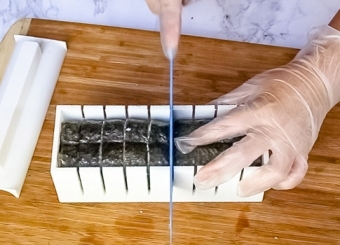 Damp your fingers with vinegar solution, then pluck some sushi rice ball onto nori. (about½ cup for thin, 1 cup for medium and 1 ½ cup for thick roll). 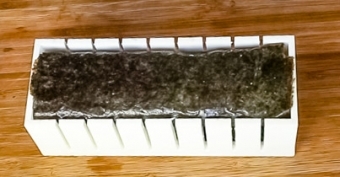 Gently spread and press rice all over the nori to create an even thin layer leaving half inch space off at one end side of nori. Do not mush the sushi rice. Arrange fillings onto rice layer. 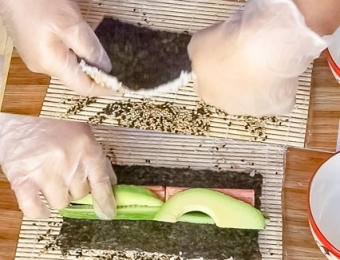 If you’re rolling uramaki, flip the nori over, and add fillings onto the nori side instead. 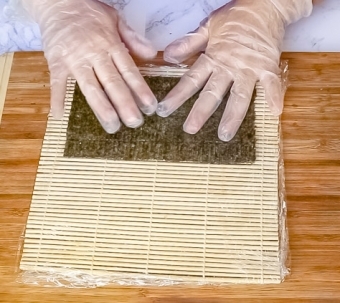 With your thumbs beneath the bamboo mat and the rest atop the sushi rice, start rolling by lifting the mat with nori over the fillings. Gently press and hold for a second, then continue rolling. Just keep press and roll until you reach the end of nori. 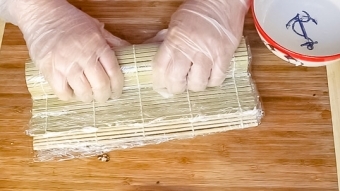 Squeeze lightly so that the bamboo mat would shape the roll. If you don’t have a bamboo mat, it doesn’t matter, you can either roll with your bare hand, or simply use a towel. The shape might not be as uniform from one end to another, but with little practice it’s still acceptable. 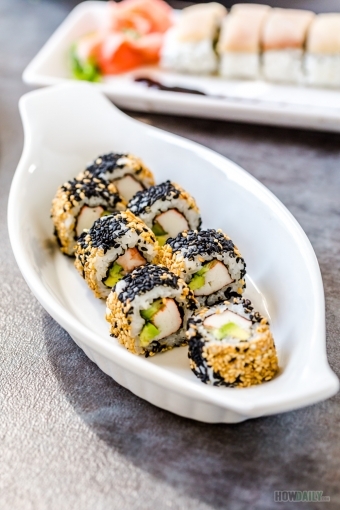 The key for rolling with your hand or a towel is that making sure it’s dry and clean, you don’t want to moist the nori or tear it down to piece. So, if your is the types that sweating a lot, wearing food gloves might help. The procedure is the same as rolling with a mat, but this time, using your thumbs and inner palm with little helps from the towel to shape and mold sushi roll into shape. 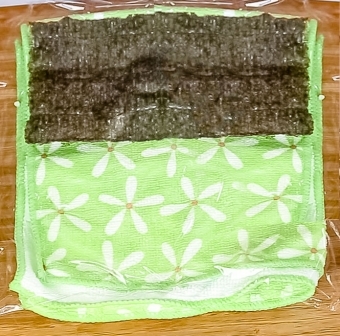 Fold the towel into quarter so that its area is a little bit larger than the nori. 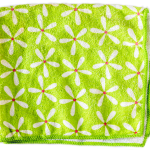 Neatly add a sheet of plastic wrap on top of the towel to keep it from sticking to the food. 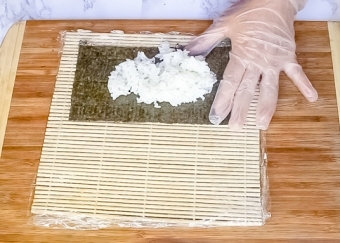 Place a sheet of nori with the texture side upward. 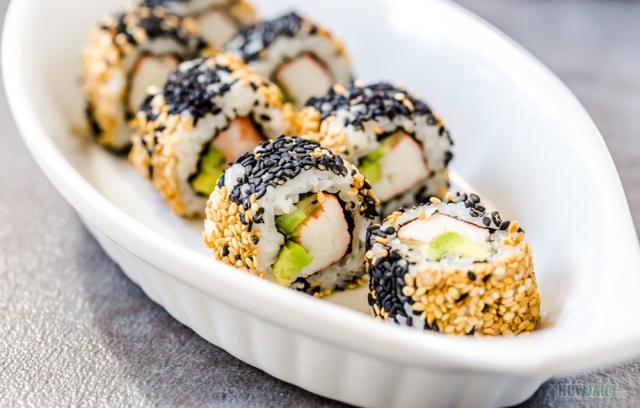 Damp your fingers with little vinegar water, then pluck some sushi rice ball onto nori. 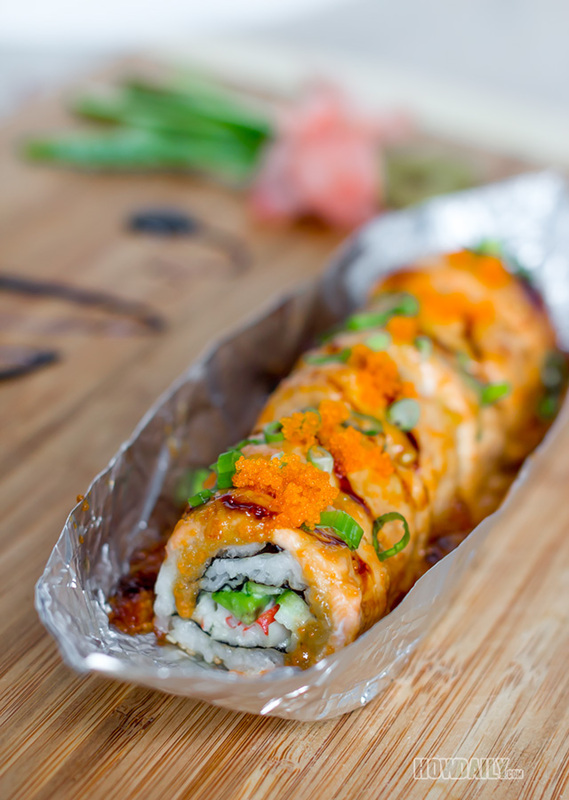 Flip nori if rolling uramaki. Arrange fillings on top. With your thumbs beneath the nori and the rest atop the sushi rice, start rolling by gently lifting nori over the filling. 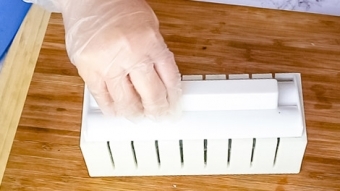 Gently press and hold all over along the roll for a second to keep things in shape, then continue rolling. 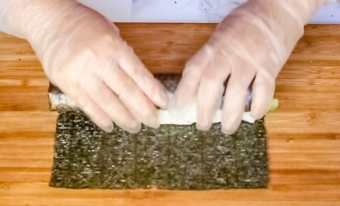 Just keep pressing lightly and roll until you reach the end of nori. 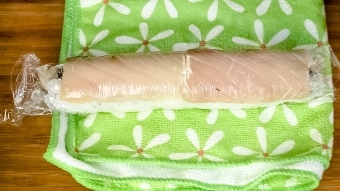 Now gently unveil the towel while keeping the plastic wrap rolled neatly around the sushi roll. 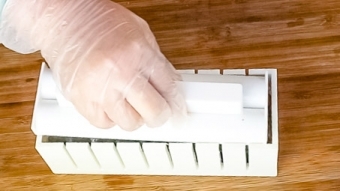 Clean your knife and cut while the plastic still on for a clean & flat cutting surface of the sushi. Unwrap each piece by gently pulling backward from the direction that you rolled. 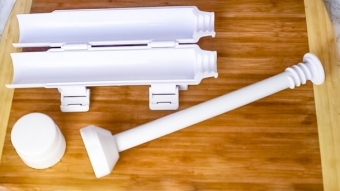 Enough with the rolling, if you got a large or small hands or simply not in the mood for any details rolling technique, then a bazooka might be the answer for you. 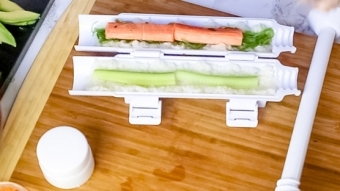 Or if you preparing maki roll for a large party and want all sushi pieces to be uniform in shape and size (I know, my kiddo always fight on getting the larger piece), this is it. 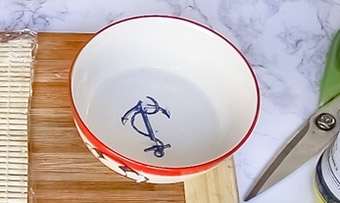 Prepare a small bowl with some water for dipping your finger. Add a spoon or two of rice vinegar in there too. Open up your bazooka, set the shaft and the end cap aside for a minute. Place both bazooka’s half plates on flat surface. Add a little over half cup of sushi rice into each half of the bazooka plate. Use your finger to spread the rice evenly along the plate. You the end of the spreading spoon to create a long ridge in the middle of the rice. Now take the shaft, using the smooth straight part of the rod to press down in the middle of both bazooka’s plates to further deeper the straight indent in the rice for easier fillings. Arrange the fillings onto rice at indentations. Align the plunger shaft back into plates’ hinge, carefully close the bazooka and secure the locking mechanism. 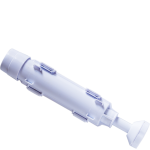 Close the end cap on and twist the shaft to compress and shape the roll. 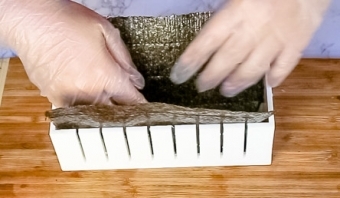 Now lay a nori sheet onto your cutting board. Remove the end cap, and push the sushi roll out of the bazooka by twisting the shaft. 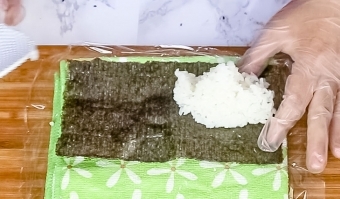 Simply roll the nori to cover the rice sushi roll. 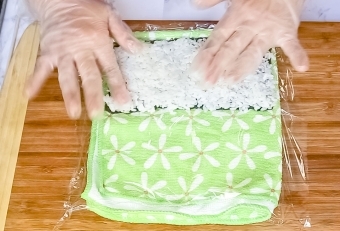 Seal the roll by lightly moist one end of the nori or just mush some rice grains on its as glue. 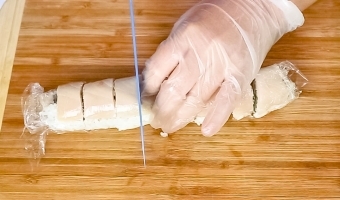 Your roll is now ready to be cut and serve. Okay, another method for making maki is by mold it into shape. Similar to the bazooka in term of simplicity but come with more variety of shapes and sizes. I’ve found that this Kitchen Boosterz All Sushi Making Kit contains most of everything you’ll ever need to mold makizushi. 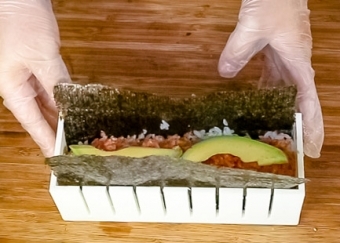 Best of all, it can help with uramaki, temaki, and nigiri as well. Place the cutting guide frame onto the desired shape base. 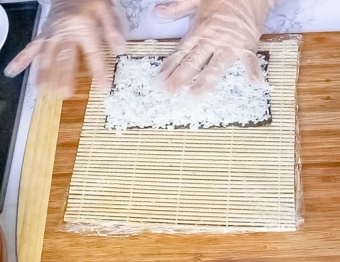 Place a piece of nori onto the base, inside the frame, use your hand to adjust it to fit in the frame leaving equal piece on each side hanging out. 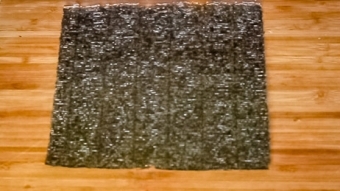 Add and spread sushi rice onto nori, filling about 1/3 of the frame. Arrange all fillings and toppings ingredients on the rice. 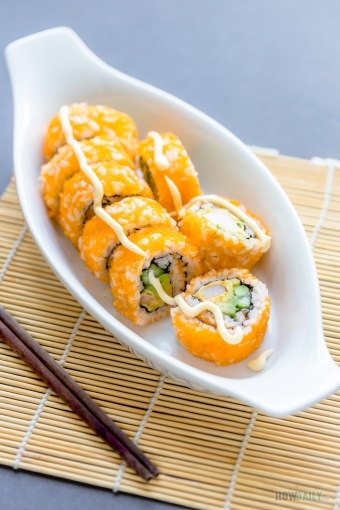 Fill the remaining space with sushi rice and spread them all over the ingredients. Tuck both nori ends in and seal it by moisting a little bit. With the desired shape lid, press into the frame in a downward motion. Remove the lid, Follow with cutting the roll through the cutting guide slots. A damp towel is necessary to clean the knife in between for a clean & smooth cut. Replace the lid, gently push it down while removing the outside frame. 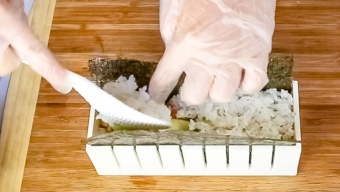 Flip the whole remained things (lid/roll/base) upside down, gently knock on the base to release sushi pieces. 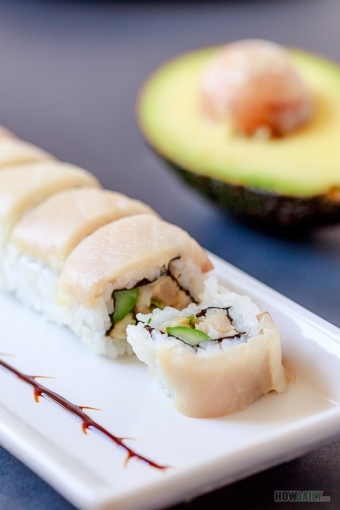 Alright, so you’ve got an idea on how to make a maki sushi roll. Let’s get onto some of the recipes. These recipes are some of the popular rolls in the States with easy to follow instruction and guidance. So, get some ingredients and let’s make some sushi shall we! !